Talented Walkley photographer Moira Gibbons has created these wonderful montages of the old street and pub signs of Walkley. Moira took them for the Walkley Historians’ Streets of Walkley exhibition, currently on display in Beeches of Walkley for the Walkley Festival. They are available as t-shirts and mounted or framed prints. 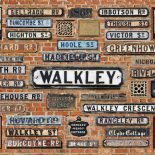 They are sure to be the must-have images of Walkley, especially if you are lucky enough to live on one of the featured streets. If you would like to order a print or a t-shirt please contact Moira directly. You can either fill in the form below to get in touch with Moira or visit her at Walkley Library Friday mornings between 10am and 12pm. Please let Moira know what you want, the size and cost in the ‘Order’ part of the form – and she will reply to you to sort out payment and take it from there. This entry was posted on June 19, 2017 by Bill Bevan in Uncategorized.